Hide in Plain Sight? Rumors that really aren't. Two headlines caught my eye in the Business + Technology section of this morning's San Jose Mercury News. Both stories were sourced from Bloomberg News. I think that some technology writers are now so eager to break the next lost iPhone story that they don't bother checking the background facts. While both of these "revelations" were credited to unnamed "people familiar with the matter", neither story is a secret. First, let's take PayPal "talking with Google". 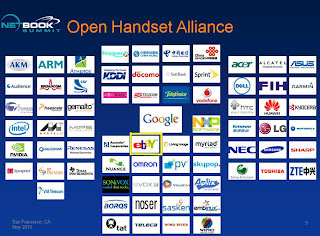 As you can see from the graphic at the top of my post, eBay was one of the founding members of the Open Handset Alliance, the group that Google established to develop the Android system. As you probably know, eBay owns PayPal. So, yeah... I think they've probably been talking to Google for quite a while. In fact, a representative from PayPal spoke at the May-26 Meetup of the Silicon Valley Android Developer's Group, about how to incorporate their payment mechanisms in Android applications. Now let's take a look at the "news" that nVidia is going to challenge Intel in the tablet market. This was announced way back in January, at the Consumer Electronics Show. The headline of an nVIDIA press release from January, 7 2010 read New NVIDIA Tegra Processor Powers The Tablet Revolution. I wonder how long Bloomberg worked to find "two people familiar with the matter"? In the image above, you can see the setup from a picture I took at Verizon's LTE demo at CES. The placard clearly shows the nVIDIA logo. 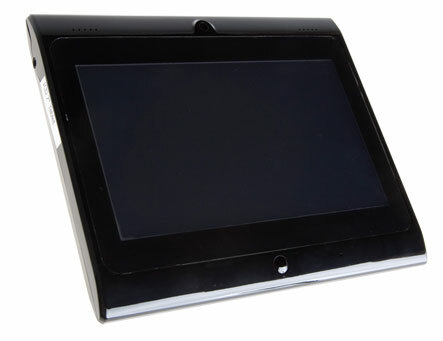 Although the Android-based tablet is often mistakenly referred to as a Motorola tablet (mixing rumors), it was in fact manufactured with the nVIDIA Tegra processor by Innovative Converged Devices. Motorola is likely working on an Android tablet as well, but Motorola's role in the CES demo was only to show an LTE modem.